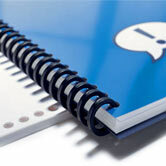 Proclick binding makes presentations stand out and is a fast & easy binding style. Proclick lets pages be easily edited and lie flat with 360° rotation for convenient note taking and photocopying. These Proclick spines are compatible with any Wire binding system. Although this is a plastic element, it is not to be confused with plastic coil binding. Each box of Proclick easy editing spines contain 100 pieces and 2 Proclick zipper tools. Proclick Binding Spines are available in Black or Navy. *Page capacities shown in the table are the approximate number of 20# sheets. For an exact fit, measure your finished document and use the sizes under document thickness in the table. Remember to include your covers when measuring.